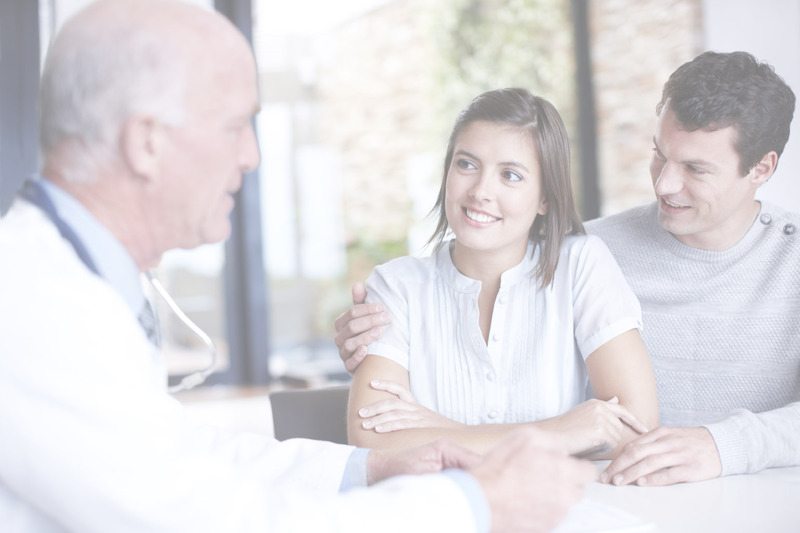 We provide JUST-a-BREAK from cancer (from a nice night out, to a couple days "get-a-way") at no charge to patients with advanced stage cancer. 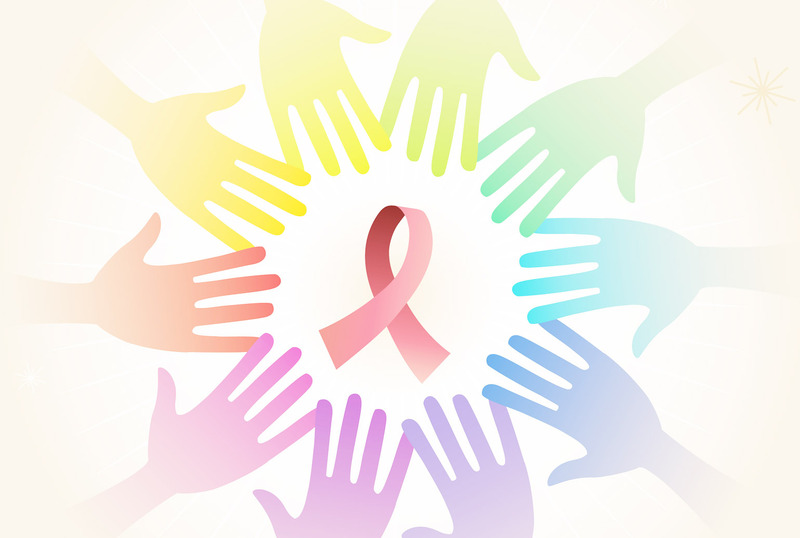 With the help of generous local businesses, donors, and volunteers, along with the assistance of local hospitals and cancer centers, JUST-a-BREAK (an official IRS non-profit organization) desires to literally provide "JUST-a-BREAK" from the ongoing emotional worries and financial toll of living with cancer. 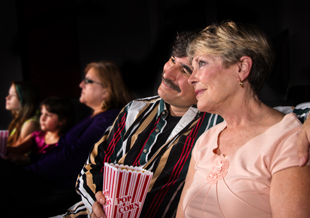 As current and past caregivers of loved ones with advanced stage cancer we "get it" and can appreciate how a simple get-a-way can provide a much needed emotional lift. We know the reality of the financial burdens of cancer treatments, and how they can prevent even that simple night out, and we want to help. We need local businesses and/or donors to help provide overnight accommodations, dinners, event tickets etc. to help us put together JUST-a-BREAK packages for local cancer patients and their caregivers. We also need volunteers to help knock on doors and make contacts and connections with local businesses. We need many to help tell the JUST-a-BREAK story. There are also other ways you can help. 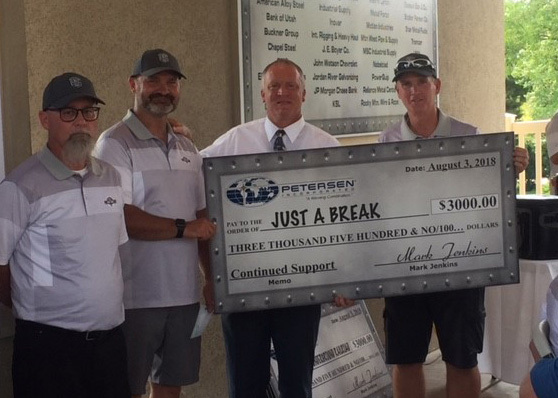 Petersen, Inc. of Ogden, Utah presented JUST-a-BREAK with a $3,000 dollar check for their continuing support at last week's 3rd Annual �Cruisin� for a Cause�. Pictured is Greg Thorpe, the founder of JUST-a-BREAK, along with Petersen's CEO Mark Jenkins and their CCO and VP of Operations Bryan Crowell and Dean Vernon. JUST-a-BREAK can't thank them enough for their support. Their donation will go a long way to help bless local cancer patients to get just a break. 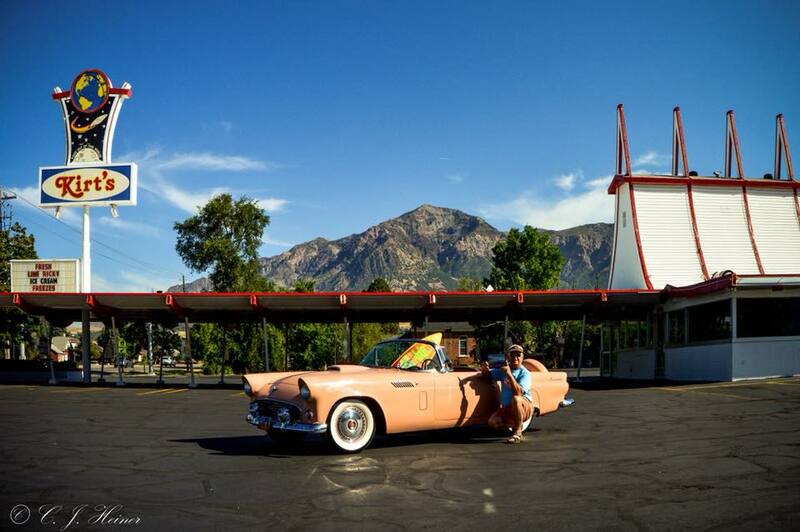 Join us this Friday, August 3, for the "Cruisin' for a Cause" Car Show. 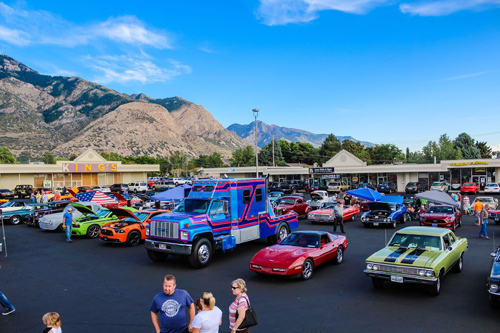 >Come join us for our 3rd Annual �Cruisin� for a Cause� at Kirt's Family Drive Inn, 1974 N 400 E, North Ogden, Utah 8441 from 5:30 PM - 8:30 PM MDT! Pre-registered vehicles will be $5, with a matching donation from Heiner's Insurance Center. Vehicles registering the day of the event will be $10. All entry fees will be donated to the JUST-a-BREAK. To register, please contact Chris Heiner, Rachel Heiner, or Matt Arave at 801-621-2620, or email us at chris@heinerins.com. Public viewing is free! For a chance to win a 1964 Cadillac Coupe DeVille, please visit www.motorsportscharity.org. All proceeds will be donated to charity. Additional donations are welcome! 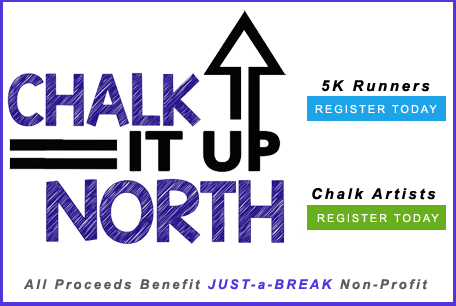 JUST-a-BREAK Presents North Ogden City’s 3rd Annual CHALK IT UP... Chalk Art Festival & 5Kolor Run! Located in the North Ogden Pizza Pie Cafe Plaza on August 24th & 25th 2018. Free Admission for all. Watch Art in the making, see the Car Show, participate in the 5Kolor Run, enjoy the Food Truck’s, Booths, Entertainment, and live music. All proceeds go to JUST-a-BREAK! Pre-registration is necessary for all artist, runners and vendors. 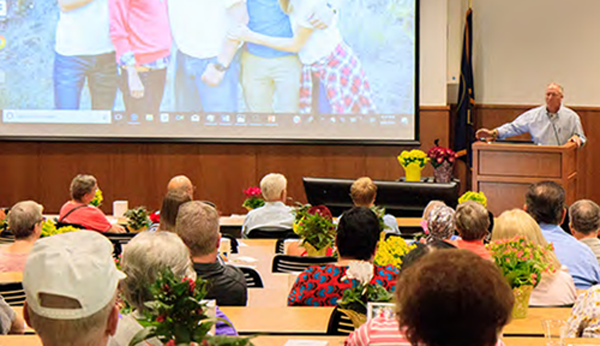 >Greg Thorpe, a local cancer support survivor whose wife Jennifer passed away in 2015, was one of the speakers at the McKay-Dee Hospital event. Jennifer battled advanced stage colon cancer, but she fought a hard fight and Greg talked about the lessons they learned. "Everyone's cancer story is so unique," he says. "Cancer helped us be more authentic and less concerned about perfection. We learned to find joy in the ordinary." Greg shared a story about the Thanksgiving after his wife's diagnosis where she surprised her family by saying she was grateful for cancer. She said it had brought her closer to her loved ones and to God / a higher power. As a cancer support survivor, Greg says, "There is life after cancer and it's one that is more informed, more passionate, and more compassionate." Photo and comments courtesty of Intermountain Stories newsletter. 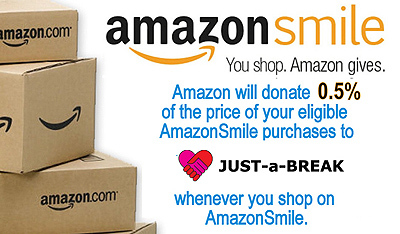 Just a reminder, every time you shop on Amazon, they will donate 0.5% of your purchase to JUST-a-BREAK. This is all made possible simply by shopping on smile.amazon.com. It is free! Costs you nothing! 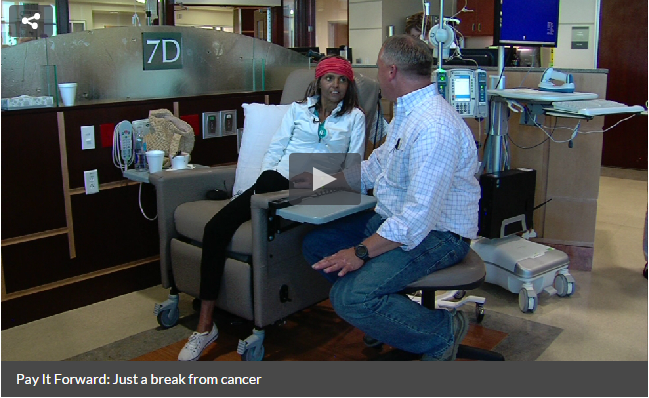 Helps provide JUST-a-BREAK to local patients with advanced stage cancer. Please sign-up now! Spread the word! Spread the smiles! 2nd Annual Heiner's Insurance Car Show benefiting the JUST-a-BREAK Foundation! Come Join us Friday, August 4th from 5:30 - 8:30pm MDT for our 2nd Annual Heiner's Insurance Car Show benefiting the JUST-a-BREAK Foundation! Participants will receive a dash-plaque and will be eligible to win awards such as "Best of Show" and "Participants Choice" as well as awards from our sponsors. Admission to view the event is free. Pre-registration is $5 per vehicle, and will be matched by a donation by Heiner's Insurance Center. Pre-registration will end on August 1st. Registration will be available the day of the event but will be $10 per vehicle. All registration fees and donations will be donated to the JUST-a-BREAK Foundation. To register, please contact Chris, Rachel, or Matt at Heiner's Insurance Center at 801-621-2620. JUST-a-BREAK has kicked off its first program with Mckay Dee Hospital & Hunstman Cancer Institute in Ogden and Salt Lake City, Utah. With over 3 dozen community sponsors, JUST-a-BREAK has been able to provide dozens of area patients with advanced cancer the simple but needed break from their normal day to day woes of living with cancer. The patients were treated to an overnight stay at one of the areas finer hotels, a dinner for two at a local restuarant, and a show or event. Feel free to contact us if you have any quesitons or would like to help JUST-a-BREAK.